Solas: I will save the elven people. Even if it means this world must die. 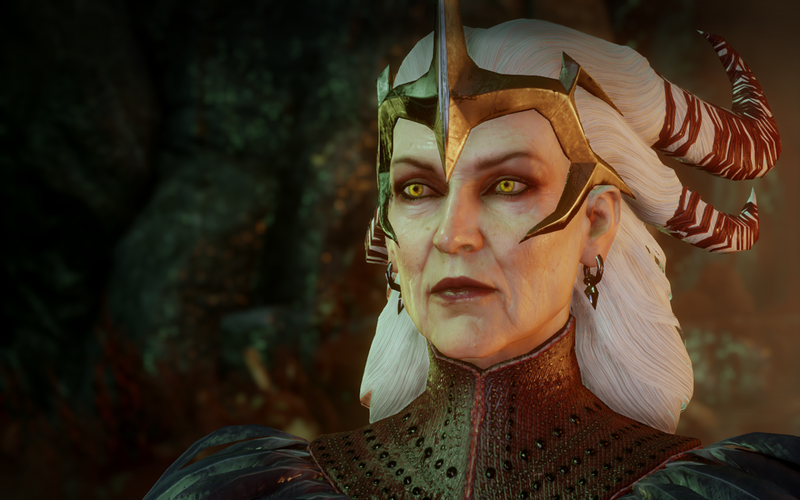 SPOILERS, on ALL of Dragon Age: Inquisition and Trespasser (and beyond) as always! massive armies singlehandedly in a few eyeblinks (in between naps). Now that we've taken a look at Solas's masterwork (the Veil), its slow and possibly inexorable decline, and where it stands at the end of the latest chapter of the Dragon Age story (Dragon Age: Inquisition's DLC "Trespasser"), let's return to the end of "Trespasser" in a slightly different way, in order to examine the questions about the fate of that very Veil that appear to lie before us as we dream, hope and wait for Dragon Age 4. So here we go... We're back at the end of "Trespasser," and you've just had the Solas chat that spawned a zillion fanfics. 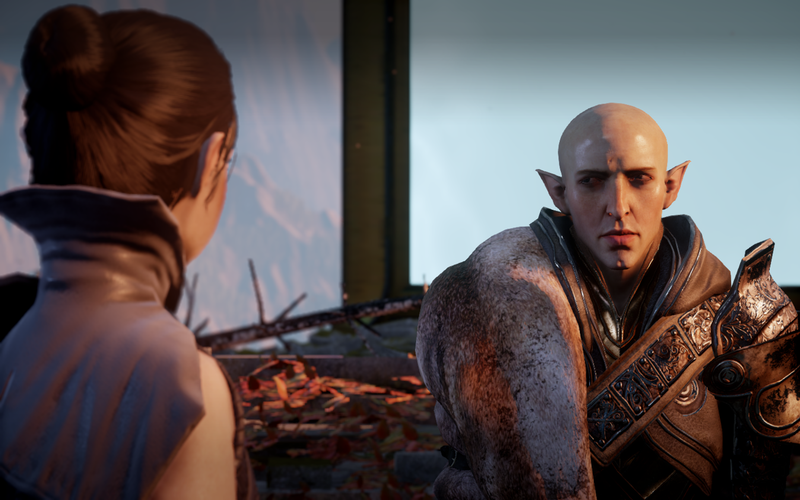 And... well, if you're like most of us out here, no matter what your feelings about Solas or his agenda, there are some complex emotions and very specific questions that may be haunting you in this particular moment. How can we dissuade Solas from tearing down the Veil? How can we defeat Solas if we can't talk him out of it? Then I had an epiphany: Those aren't the right questions. Because I believe (as I posted previously) the Veil is already almost certainly doomed. I've kept thinking about "Trespasser" and that last informative, emotionally charged conversation—a conversation that reveals who Solas is (and was), what he wants, and that emphasizes in no uncertain terms that his ultimate goal is to tear down the Veil, undoing his act of approximately 4,000 years before that inadvertently doomed his people. This appears to set us up for a satisfyingly rich struggle in Dragon Age 4, in which we'll presumably have to counter Solas in his quest to redeem the elven people and bring back their golden age. We're even further asked to choose, specifically, what our next goal will be—to kill Solas, or to redeem him. There's just one problem: Solas is too powerful to fight. This is why I think the setup of having to kill or redeem Solas at all is ultimately going to prove to be a masterful job of total misdirection. Do I think the "kill" or "redeem" choice will be useless? No—I do think it will have real effect on how the DA4 protagonist, and possibly the returning Inquisitor, chooses to deal with Solas when they encounter him again in DA4 (I suspect our Inkies will return much as Hawke did in DAI, as featured guest companions, although I'd certainly love an actual first-person interlude). 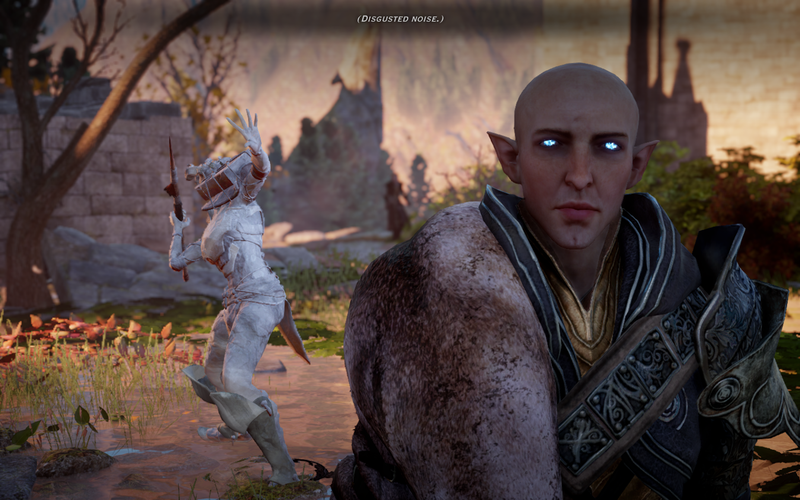 But back to the end of "Trespasser": Look at how powerful Solas is here! He's unbeatable. The brief glimpses of his abilities that we're given at a distance, as we pursue him through the eluvians, secret valley fortresses, Darvaarad, and through the remnants of the Vir Dirthara, are staggering. As Solas battles the Qunari who are defiling his ancient hideouts and expels them from the pathways through his network of eluvians, he releases explosions of magic that are epic in diameter—they're almost atomic. Then comes the revelation of Trespasser's final chapter, that Solas can now, like some ancient vengeful god, actually turn people to stone with a thought. after our meeting. My bet is that he joins Solas... and gets a new name. And keep in mind—this is before he takes in his final power-up—absorbing the power of the Anchor to save the Inquisitor's life. In other words, if you chose "Kill Solas" at the end of "Trespasser," your odds aren't exactly looking too favorable. Solas may claim he's not a god. But isn't that just semantics at this point? At the end of "Trespasser," even without the assets above, he's so powerful that he could destroy entire opposing armies all by himself, in between naps. For these reasons, to me, there's just no way the main plot of Dragon Age 4 is going to be us versus Solas. This is the point where it's worthwhile to go back and think about the entire trilogy of Dragon Age: Origins, Dragon Age II, and Dragon Age: Inquisition. In each story, a few common themes have always emerged—the struggles against evil (and corruption) from within and without; the fights against prejudice (both racial and magical), the struggle for justice in a system in which justice can be defined as multiple things by multiple people, organizations, and even religions. And percolating beneath all of this has been the persistent idea that every single one of these wars, calamities, Blights and other tragedies has physically harmed the world and weakened the Veil. And if the Veil is slightly tattered in Dragon Age: Origins from the centuries of violence, Blights, and carnage across Thedas, it is pretty much shredded to bits by the time Dragon Age: Inquisition rolls around. To me, there's just no saving the Veil. Unless—in the best irony ever—Solas decides to help us do so. The Chantry teaches that the Veil was erected in -3100 Ancient by the Maker. While this tallies roughly with other timelines, I definitely enjoyed picturing the look on Solas's face when he heard this assertion for the first time. Solas, however, confirms in "Trespasser" that it was he himself who created the Veil, as punishment against the Evanuris for their murder of Mythal and as his final attempt to protect the world from those tyrants among the Evanuris who were pretending godhood, enslaving their own people, and slaughtering mortals across Thedas. about Flemeth and Mythal, whose murder inspired Solas to create the Veil. My picks for the Evanuris Big Bads here would include Falon'Din and Andruil, both of whom were famously bloodthirsty (and not a little crazed with power), and both of whom were also actively antagonistic to both Mythal as well as to Fen'Harel. I'd also definitely think Elgar'nan had to have been a primary antagonist (and the idea that it was Mythal's semi-divine husband who wronged her certainly ties with the stories of betrayal and rage hinted at from Flemeth, previously), as his tyrannical exploits are also mentioned specifically in the beautifully written Codices for "Trespasser," as well. Either way, the Veil went up, the false gods were silenced, and the elves doomed, all at the very same moment. Not only did the Veil sunder the elves from their magic and immortality, I also believe it is the one thing that actually allowed humans to enter (and survive) in Thedas. It's referenced numerous times in DAI that the Veil went up before the first humans appeared in Thedas. It is therefore entirely possible that a world without a Veil would not be survivable for humans at all. 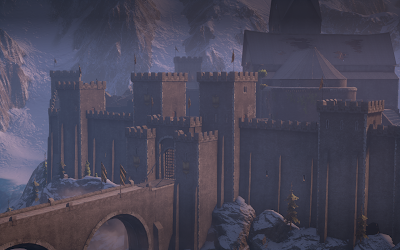 The elven kingdom of Elvhenan, meanwhile, would have stood in glory for well over 5,000 years at that point. How ironic is it that it was Solas, of all people, who made it possible for humans to rise to greatness? Skyhold's original name during the days of Elvhenan was Tarasyl'an te'las, translated roughly to "Sky-Place-Held-Back," or "the place where the sky was held back" and this pretty much confirms that this is where the creation of the Veil took place (I suspect that this was also the name of the ritual Solas accomplished in doing so, as well). 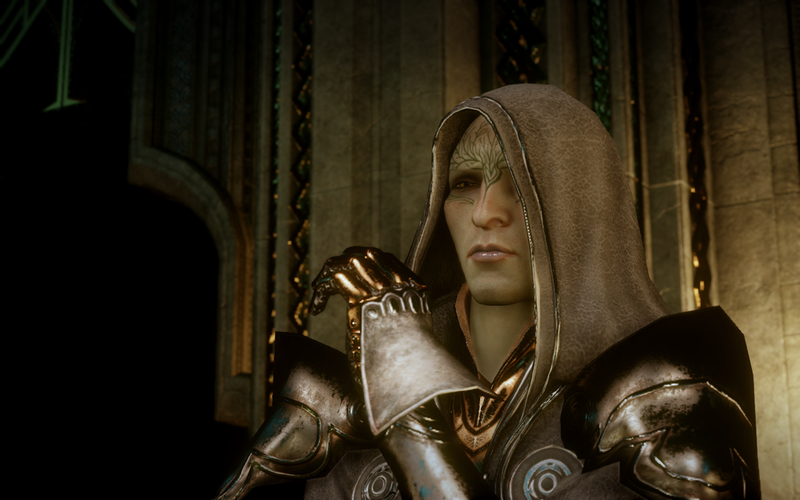 Solas also confirms that it was once his castle (interestingly, only admitting this to a low-approval Inquisitor). So, as I've noted elsewhere, Solas's arrival at Skyhold is not only a homecoming for him, it's him literally returning to the site of his greatest act and most terrible regret. Solas's creation of the Veil millennia back was a feat of prodigious magical skill. It's no wonder, then, that the act of doing so blasted the foundations of Skyhold, depleted his powers and sent him into a sleep of millennia. While Solas implies it was a sleep of a thousand years, it seems as if it was actually over 4000... unless he awakened occasionally? That's my theory—that he awakened, roamed the Fade, watched movies, had the occasional fling with a spirit, and maybe occasionally walked within the consciousnesses of mortal elves (like perhaps Shartan). This is also a good time to ask... where was Solas in uthenera at Skyhold, which was occupied many times during those millennia? My bet is that he wrapped himself in spells and hid himself in the depths. I also think he was able, while dreaming in the Fade, to frighten the dreams of those who occupied the castle, perhaps giving local dreamers a taste of the Dread Wolf and, ahem, encouraging them to depart. 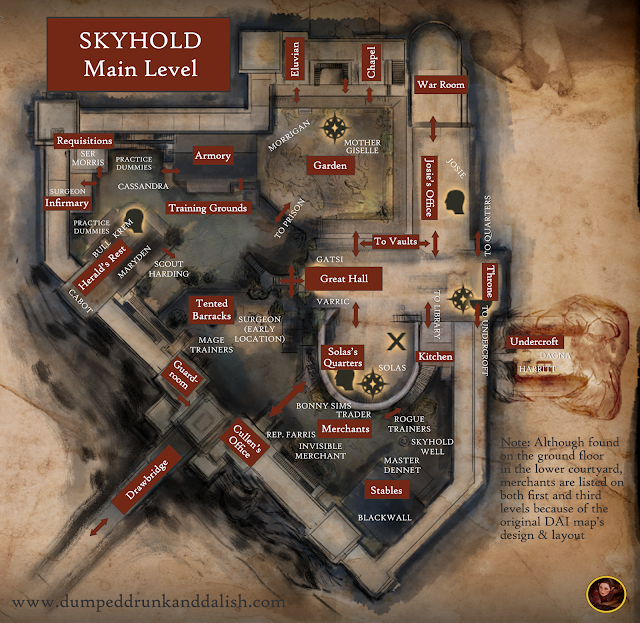 This would also explain why Skyhold never seemed to stay occupied for long, and if the occupiers tended to leave in a hurry, this would also account for why there's so much beautiful, usable stuff around the castle when our faithful team arrives there. Either way, Solas enacted his vengeance, wrapped himself in shadows, and slept for millennia. And even as he did so, the Veil almost immediately began to weaken and decay. It's an interesting thought to realize that Solas created the Veil, then slept through all its best years. It's like he gave someone a comfy blanket, took a nap, then woke up and the blanket had been ripped, torn, gnawed, and nearly destroyed in the meantime. Either way, the Veil is in pretty dire shape. So what next? And can it be saved? This brings me back to my original epiphany: As "Trespasser" ends, the implication is that we must find a way to stop Solas. But to me that's richly ironic. From what I can see of the Veil's current situation, there's absolutely no saving it. In other words, Solas actually doesn't have to do a thing to return the world to the state of its former Fadetastic glories... except sit back and wait. before him in Dragon Age 4. Which is why I'm convinced that this is all a deliberate and brilliant piece of misdirection by the Dragon Age writers. The writers are waving those shiny, shiny questions at us off over there... when we really need to be looking over here. Unless Solas decides to do so himself. To me, there's a beautiful irony and symmetry to the idea—that the one person in all of Thedas who could actually save the Veil is the very man who is determined to tear it down. And I think Solas will save the Veil, after (I'm guessing) another huge conflict to shake Thedas to its foundations. My personal bet for the next Big Bad isn't Solas, but one of the Evanuris or Forgotten Ones, with maybe some new revelations about the Titans, and along with some massive upheavals as both Tevinter and the Qunari make their moves to try to conquer the world once and for all. Meanwhile, I suspect that Solas will haunt the perimeter of DA4, judging and watching, perhaps even subtly helping the Inquisition (or whatever the new movement calls itself). Then I think he'll finally choose a side—ours. And that he will then use those incredible powers of his to recreate a brand-new Veil, this one perhaps even stronger than before. I don't think he'll survive it (I hope I'm wrong). But that's my bet. Of course, I could be absolutely and hilariously mistaken about all of this. But what do you think? At first, I want to say my heart stopped when I read that Solas probably won't survive creating the new Veil -mainly because I can see that you can be 100% right ;C plus, I really like what you accomplished in the whole article! I totally agree with that "choice" we have as an Inquisitor - I also think there isn't in fact any choice, that it's only illusional. BUT I was also thinking many times about how our romance with Solas could change his decisions. What if there'll be two endings - one for friend and one for a lover? Imagine the scene when you can die with him, because you can't live without him! Or that you could have more options if you are in love! We already were given much more content of the DA lore when we romanced him (for example about the Vallaslins), what if they continued to give us so? Or those are only my ilusions because I love him, and I seriously would very likely destroy Thedas and watch it burns, only if it meant beeing with him FOREVA <3 I'm sick, I know, but I'm seriously crying of excitement when I think about new DA and I can't wait!! First off, thanks for reading! I'd love it if there were multiple potential endings depending on whether Solas was a friend, lover, or low-approval antagonist. And whether we picked "Kill" or "Redeem." I suspect we'll get a ton of additional lore in the next game, and hope a lot of it will be very tied to the Evanuris, the Titans, and other mysteries we're only just unraveling.